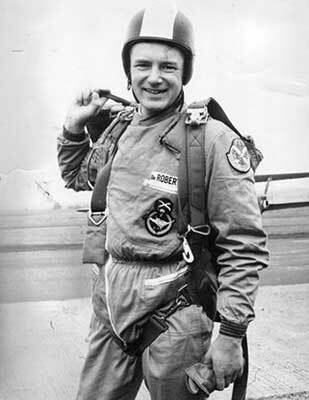 Doctor Charles Robertson made the first jump of the Scottish Parachute Club on April 10th 1960 at Scone Aerodrome Perth. The aircraft used was Tiger Moth G-AHUV piloted by Tom Blyth. At this time 'Doc' was a General Practitioner with a family practice on the South Side of Glasgow. Doc had made his first jumps with the RAF at Abingdon, during his National Service as the doctor at the parachute school there. On returning to Glasgow he continued practicing his new sport by forming the first parachute club in Scotland. Scottish Parachute Club pre-dates the British Parachute Association, which is now the governing body of the sport in Great Britain. With very few rules or other parachute operations to provide guidance, much was to be learned and put in place. The first two members of the club were Charles Robertson, and Jim Taylor from Dundee. To build the membership of the club, various articles and adverts were placed in the Scottish press to recruit new members. Other founder members of the club were Stan Moffat, Maureen Brown, Phil Moffat, Jim McDiarmid, and George McEwan.